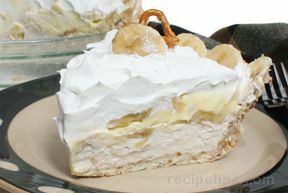 Made with a graham cracker crust or a regular pie crust, this delicious creamy banana pie will be enjoyed by all. If you prefer your pie without meringue on top, this is the perfect cream pie for you. For another great pie, try our Coconut Cream Pie recipe. Prepare refrigerated pie crust according to package instructions for a one crust pie with cream filling. Or for a Graham Cracker Crust: heat oven to 350° F. In a small mixing bowl, combine cracker crumbs, sugar, and butter. Press crumbs firmly against the bottom and sides of the pie plate. Bake the crust for 10 minutes. Cool. In a medium sauce pan, combine sugar, corn starch, and salt. Over medium heat, gradually whisk in milk. Stir constantly until filling becomes thick and reaches a boil. Boil filling for 1 minute. Gradually add egg yolks. Continue to whisk filling mixture constantly while bringing to a boil again. Boil for 1 minute. Remove filling mixture from heat, blend in butter and vanilla. 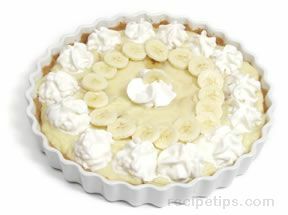 Place 1 layer of sliced bananas in the bottom of cooled pie crust. Then, pour filling into pie crust. If desired, garnish with additonal bananas and whipped topping. 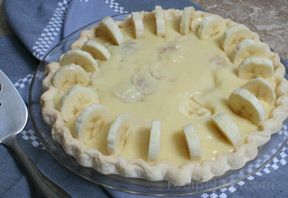 "I love banana cream pie and this recipe was delicious. I am not great at making pie crust so I made the graham cracker crust. This recipe is a keeper." "I loved this reciepe! The pie was the best!"